It might be very rare (actually it happened to me only once, few months ago, while doing "dev work" and I had no RS232 cable, I locked myself out because of a bad rom flashing) but if your device seems dead and refuses to boot to recovery using the bottom located pinhole as trigger to enter recovery (see CWM or TWRP threads for more infos about entering recovery) don't be afraid because, unless you suffer of an hardware failure, you will be able to unbrick it using this MicroSD rescue method. 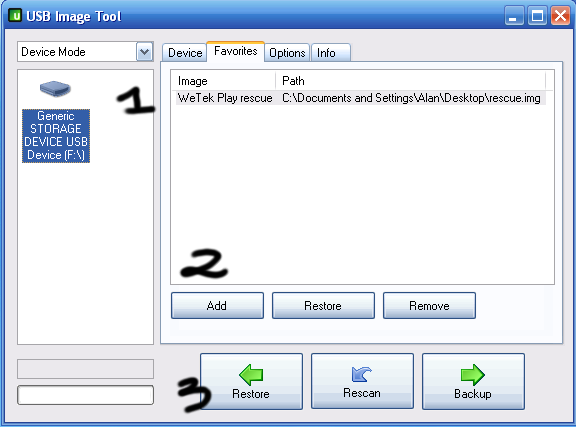 Download "USB Image Tool" and "WeTek Play rescue" files (you can use 7-zip to unzip them). Plug a MicroSD to your PC using an adapter / card reader (backup anything on it because its content is going to be erased) and launch "USB Image Tool.exe". Your rescue MicroSD has now been created, you can unplug it from your pc and insert it in WeTek Play's MicroSD slot (remove any USB peripherals eventually connected), and boot it with the usual "recovery trigger" combination. To restore your MicroSD to its original capacity (I created a 512MB rescue image so now your MicroSD will be listed as a 512MB one) you can use SD Formatter choosing those options: "FORMAT TYPE -> FULL (Overwrite)" and "FORMAT SIZE ADJUSTMENT -> ON"
On Linux you don't need any tool like "USB Image Tool" because every distro comes with "dd" command bundled. 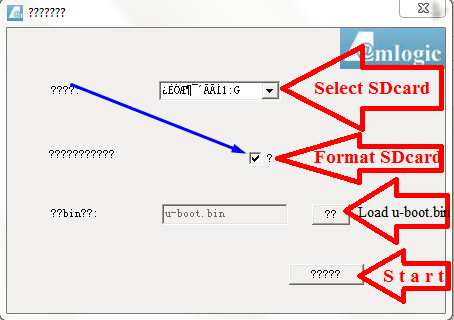 Just plug your MicroSD to your pc and with a command like "dmesg | tail" see how your kernel names it (it can be something like "sdb" in case you have only one SSD/HDD installed or "sdc", "sdd", etc.). Anyway, once you know what's your MicroSD card path (pay extremely attention to it or you might wipe important data if you choose the wrong unit), just type a command like "sudo dd if=/path/to/rescue.img of=/dev/sdc bs=512". Actually the cool thing is that you can do the same using a spare WeTek Play (in case you own more than one unit): just insert the MicroSD in its slot, put the rescue image on a flash drive and plug it in. Now, if you're using one of my custom rom builds your flash drive's content will be located under "/storage/usbdisk0", "/storage/usbdisk1" or "/storage/usbdisk2" (I did this to allow Android's vold to be able to mount at the same time up to 3 disks / flash drives, one per WeTek Play's USB port), just check with a command like "ls /storage/usbdisk0" where is located your rescue image and modify the dd command according to it. Example: "su" (accept the eventual SuperUser / SuperSu prompt) and after that "dd if=/storage/usbdisk0/rescue.img of=/dev/block/cardblksd bs=512"
It looks like i've bricked mine, so as i don't boot incorrectly " and boot it with the usual "recovery trigger combination" does this mean boot the system as we do reflashing the box ie press and hold the reset button on the bottom of the unit and plug in the power? or do i just reboot with the SD card and let the system take care of the repair? as above ? any promting to another solution ? dead link usb tool. see CWM or TWRP threads kut forum dit noting works her!! Is a different rescue image needed for the wetek openelec? Edit: Some more info:I bought an wetek openlec, had e2 running on msd, all ok, went to install e2 to nand and now, didn't work and i factory reset via recovery which i think wiped openelec from nand? I ran the rescue img and now it boots up to the wetek play splash logo and bootloops without a msd. If i insert the msd with e2 on it. It will boot into that. Anyone have any tips on how to get the box back to the way it was on day 1 with openelec preinstalled? Seems the only method I haven't tried is the hard recovery but I really don't want to do that unless I have no other option. You must read the second message. Tried that before and didn't work. Just tried it again now and it worked, not sure why but I'm back up and running now anyway thanks. I would say that I've bricked the wetek play too if I would have a clear idea about how a bricked machine doesn't work. I tried to run openelec from an SD card and after a negative result (who knows why so far) the wetek play starts with the white splash screen with wetek.play written and keep rebooting endless stopping at this point. Also the Wetek play rescue doesn't exist on Mega NZ anymore.. Your wetek has Android or OpenELEC on NAND? HI there thanks for your attention!!! After creating a recovery sd card with linux and dd command as suggested I followed the recovery procedure but nothing has changed. Rom apparently installed and self reboot. Box start but keeps looping up to the white splash screen. At this stage I'm thinking about installing the recovery and ROM using ADB and serial cable but I'm not sure it is correct nor I know the procedure. Do you think that this issue is after a try to start openelec from SD this could not have damaged the file system? But this is only possible if you have a serial debug connection to your pc. I need to find a serial 2usb adaptor. Do u have any suggestion about what to buy or more important what not to buy? Could u check that the files from you links are not corrupted some how? After the first run with the program, with the format option enabled. When it ends eject the mSD card, insert it again and load the u.boot.bin manually. And it should be ready to use. "fatload mmc 0 0x82000000 u-boot.bin"
"sf write 0x82000000 0 60000"
4096 KiB MX25L3205Dat 0:2 is now current device"
"NAND bbt detect factory Bad block at a8200000"
It seems you have loaded a bootloader from a different device and with a bit of luck, all went fine. Just Install an Android build and see if the u.boot boots normally. I tried to reinstall Androind as I did positively the first time. I've the log from putty if you'd like to take a look at it but I need your email. Here a couple of lines which worn me a bit. Erasing at 0x2800000 -- 1% complete. Erasing at 0x5000000 -- 2% complete. Erasing at 0x7a00000 -- 3% complete. Erasing at 0xcc00000 -- 5% complete. Erasing at 0xa3c00000 -- 64% complete. Erasing at 0xa9000000 -- 66% complete. Erasing at 0xffe00000 -- 100% complete. USB (1) PHY Clock not detected! dwc_otg: Highspeed device found ! Err imgPack(L72):magic of oldest img not item header! [ 3.945589@0] ####Version of Uboot must be newer than U1.06.011!!!!! [ 3.978765@0] No NAND device found. [ 4.089614@0] nand env: nand_env_probe. [ 4.090282@0] nand key: nand_key_probe. [ 4.141611@0] 0x000000800000-0x000001000000 : "logo"
[ 4.148734@0] 0x000001000000-0x000001800000 : "aml_logo"
[ 4.150099@0] 0x000001800000-0x000002000000 : "recovery"
[ 4.151295@0] 0x000002000000-0x000002800000 : "boot"
[ 4.152489@0] 0x000002800000-0x000042c00000 : "system"
[ 4.153746@0] 0x000042c00000-0x000062c00000 : "cache"
[ 4.154959@0] 0x000062c00000-0x000072c00000 : "backup"
[ 4.156167@0] 0x000072c00000-0x0000ff000000 : "data"
[ 4.311565@0] all block full!! [ 4.437250@0] all block full!! [ 4.525136@0] all block full!! [ 4.926113@0] all block full!! So the Android still doesn't boot? Upload the full log on MEGA and post it here, so we can take a look at it. The box doesn't boot, still looping but at least I gained the white wetek splash screen. If it is so at least I know that is not a way of using an Serial2USB cable! Your last logs require a verification key, i cannot access without it. Re-upload them please or send me private message with the key.